Growing out bangs can be a long, frustrating process. Knowing how to style or cut your hair during this time can save you from bad hair days. Bobby pins - Bobby pins are small, double pronged hair pins that have a smooth side and a wavy side to grip hair. 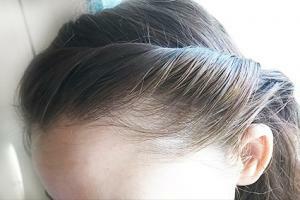 They easily slide in and secure bangs that are twisted or braided. Small barrettes - Barrettes are also known as a hair clasp or hair clip and are used to gather and hold hair. They can be made of metal or plastic and look fancy or plain. They can easily be clipped into bangs in place of a bobby pin or beside a bobby pin for decoration. Headbands or headscarves - Headbands are horseshoe-shaped bands of metal or plastic. Headscarves are cloth accessories like neck scarves. Both are worn to hold hair out of the face and eyes, either pushed back to just beyond the bang area or further back toward the crown. Hairspray is optional, but may be needed for taming flyaway hairs. These simple styles to hide bangs are classic and appropriate for any age. Young girls might choose bright colored accessories or barrettes with flowers or characters. Teens and women can pull off these looks with simple bobby pins or headbands matched to their hair color or scarves that match an outfit. Try these looks that can be easily accomplished in just a few minutes. This style is easy and can be casual or dressy depending on the headscarf you choose. You can place the knot wherever you feel is most flattering. Tie the headscarf loosely around your neck or at your forehead before sliding it back, capturing your bangs. Wrap the ends around your head until there is just enough left to tie. Tie the ends into a knot. A small braid across the bang area from ear to ear lends beautiful boho style to your hair. To achieve this look your bangs must be at least to the tip of your nose. You work this braid as you would a French braid or a Dutch braid, starting at one side and moving to the other. Make about a two-inch deep section from the front hairline sectioning from the side part to your ear. Begin twisting at the part in your hair by running your index finger from the back of the section to the front gently flipping the hair back in a twisting motion. The size or puffiness of the twist will depend on how tight you twist your hair - the tighter you work, the thinner the twist will be. Twist the hair toward the back of the head and stop just in front of the ear. Use two bobby pins to secure the twist at the ear. Make sure at least the tips of the bobby pins cross each other so that they will stay in place. If your twist looks loose anywhere, use a bobby pin and place it in the back of the twist pointing toward your ear. Smooth any flyway ends with a light mist of hairspray. There is a couple of hair cuts that hide bangs successfully, allowing the hair to grow out at the same time. This will ease frustration over your unruly bangs. Whether you choose to go long, medium, or short, having your hair cut into layers or a deep side bang will allow your bangs to grow out gracefully. Make a shallow side part. To hide existing bangs, take a diagonal part from side to center to hide the shorter hair. Use a medium hold styling cream wax to hold the bangs in place and finish with hairspray. A layered hair cut is very forgiving of any area of hair that you are trying to grow out, such as cutting a brush out of your hair or growing out bangs. This is a style that can be successfully done with any length of hair. For growing out your bangs, you can opt to have your hair cut so that your bangs are the first layer in your style. However, this is a mistake to do if you have curly hair unless you already have a short cut, as curls will cause the hair to shrink back toward the scalp. This look can easily be a wash-and-go style, and it is easy to achieve. Speak with your stylist about a layered cut that will work with your hair texture, explaining that your goal is to grow out your bangs. Once you've got a great cut, layers are simple to style. Apply a mousse or styling cream to towel-dried hair. Comb the product through and shake the hair loose with your fingers if you hair is straight. For curls or waves, gently scrunch the damp hair. 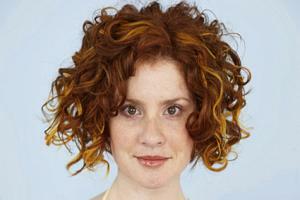 For curly or wavy hair, allow the hair to air dry or use a blow dryer with a diffuser. Give straight hair some volume and gentle curl by using a round brush while blow drying. Growing out your hair is a series of awkward phases if you do not know how to style it. Whether your bangs were cut too short or you are just tired of them, growing out your bangs does not have to be frustrating. If you are not one to wear hair accessories, the easiest way to get past the awkward stages is to cut your hair into face framing layers. Keep the ends of your bangs trimmed and make sure you are using a quality shampoo and conditioner. Healthy hair grows faster.